A model for team leadership and management. John Adair's simple Action-Centred Leadership model provides a great blueprint for leadership and the management of any team, group or organization. Action Centred Leadership is also a simple leadership and management model, which makes it easy to remember and apply, and to adapt for your own situation. Good managers and leaders should have full command of the three main areas of the Action Centred Leadership model, and should be able to use each of the elements according to the situation. Being able to do all of these things, and keep the right balance, gets results, builds morale, improves quality, develops teams and productivity, and is the mark of a successful manager and leader. 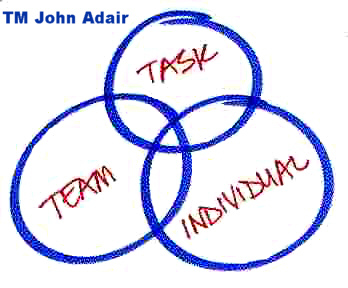 The three parts of Adair's Action-Centred Leadership model are commonly represented by three overlapping circles, which is a trademark belonging to John Adair, and used here with his permission. Adair's famous 'three circles' model is one of the most recognizable and iconic symbols within management theory. When you refer to this diagram for teaching and training purposes please attribute it to John Adair, and help preserve the integrity and origins of this excellent model. John Adair, born 1934, British, developed his Action Centred Leadership model while lecturing at Sandhurst Royal Military Academy and as assistant director and head of leadership department at The Industrial Society. This would have been during the 1960s and 70s, so in terms of management theories, Adair's work is relatively recent. His work certainly encompasses and endorses much of the previous thinking on human needs and motivation by Maslow, Herzberg and Fayol, and his theory adds an elegant and simple additional organisational dimension to these earlier works. Very importantly, Adair was probably the first to demonstrate that leadership is a trainable, transferable skill, rather than it being an exclusively inborn ability. He helped change perception of management to encompass leadership, to include associated abilities of decision-making, communication and time-management. As well as developing the Action Centred Leadership model, Adair has written over 40 books on management and leadership, including Effective Leadership, Not Bosses but Leaders, and Great Leaders. Leadership is different to management. All leaders are not necessarily great managers, but the best leaders will possess good management skills. One skill-set does not automatically imply the other will be present. Adair used the original word meanings to emphasise this: Leadership is an ancient ability about deciding direction, from an Anglo-Saxon word meaning the road or path ahead; knowing the next step and then taking others with you to it. Managing is a later concept, from Latin 'manus', meaning hand, and more associated with handling a system or machine of some kind. The original concept of managing began in the 19th century when engineers and accountants started to become entrepreneurs. There are valuable elements of management not necessarily found in leadership, e.g administration and managing resources. Leadership, on the other hand, contains elements not necessarily found in management, e.g inspiring others through the leader's own enthusiasm and commitment. The Action Centred Leadership model is Adair's best-known work, in which the three elements - Achieving the Task, Developing the Team and Developing Individuals - are mutually dependent, as well as being separately essential to the overall leadership role. The Action Centred Leadership model, therefore, does not stand alone, it must be part of an integrated approach to managing and leading, and also which should include a strong emphasis on applying these principles through training. Adair also promotes a '50:50 rule' which he applies to various situations involving two possible influencers, e.g the view that 50% of motivation lies with the individual and 50% comes from external factors, among them leadership from another. This contradicts most of the motivation gurus who assert that most motivation is from within the individual. He also suggests that 50% of team building success comes from the team and 50% from the leader. More information available via John Adair's website (academic enquiries and discussion of principles). See also Adair International (model application and delivery support). Where you refer to John Adair's ideas about Action-Centred Leadership in teaching, training, coaching and learning please ensure you always attribute the concept and diagram to John Adair. This will help preserve the integrity and origins of his work. For general training, teaching and learning purposes you can, of course, refer to Adair's ideas and reproduce the three circles diagram, although when doing so please ensure you include the fact that the three circles are a trademark belonging to John Adair. As ever please show the proper attributions, ownership and origins of the ideas in such usage. As with many of the pages on this website, this section on Adair's Action-Centred Leadership is a summary interpretation and an introduction to the ideas. If you want to find out more about John Adair's work, to explore his theories in more depth, or to use his ideas for publishing or commercial training programme design and delivery, you must seek permission and/or licence to do so, which can be pursued via John Adair's website, where there are good people able to help you. See also Adair International for specific support in applying John Adair's work within organisations. This page is provided free for learning and development with permission from John Adair, which is gratefully acknowledged. The overlapping three-circle Action-Centred Leadership logo is a trademark of John Adair.